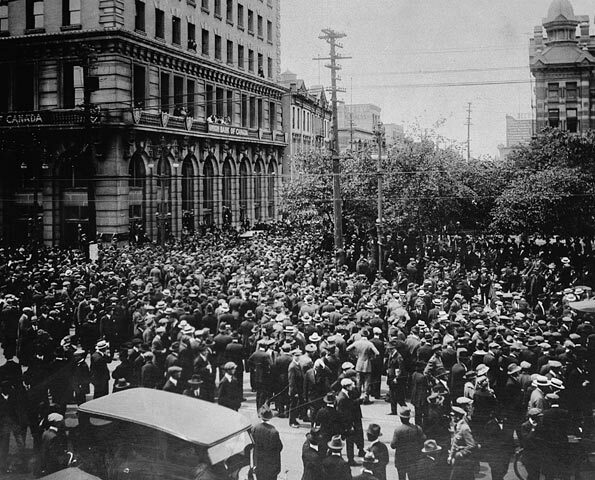 In just a few months, we will be in the midst of celebrating the 100th anniversary of the Winnipeg General Strike, where thousands of workers walked off the job, initially to support the traditional bargaining demands from some of the city’s established unions, but eventually to demonstrate a more systemic challenge to the social, political, and economic status quo which reigned across Canada in the aftermath of the Great War. But this is all so far away from us today, is it not? Aren’t the efforts of those working-class and socialist activists—however storied—a relic of the past? What can that all mean in an age like ours? Quite a bit, it turns out. The strike took place in the spring of 1919, in a context of deep socioeconomic strife. The end of the war led to unemployment, which was exacerbated by veterans returning from the European front. This war was not only meant to end all war, but to usher in a just social order. As we know, neither happened, and this left many Canadians dismayed. In this context, building and metal trade workers appealed to the Trades and Labor Congress’ Council in Winnipeg to support them in a general sympathetic strike to win key demands such as recognition of their bargaining units. The result—no doubt driven in part by a climate of social injustice—led to most of the city’s working class population striking and shutting Winnipeg down. This led to a coordinated counter-assault, as the Canadian state, the Royal Northwest Mounted Police, the Winnipeg press, a special group of police officers (scabs replacing the strike-supporting city police), and the city’s elite organized into the shadowy Citizen’s Committee of 1000, worked to successfully break the strike by demonizing ‘alien’ elements among the strikers, and by arresting its leaders. In this way, the strike could be deemed a defeat, at least in the immediate term, as capital reasserted dominance over the city, and didn’t meet the strikers’ demands. But such is not the case, and in both the short term onward, the strike led to positive reforms, the rise of new forms of labour organization, and the birth of new political parties. Beyond this comes the reality that the lessons of the strike apply still. Indeed, the strike remains relevant, not just because it stands as a crucial watershed in the history of Canada’s labour and left movements, but because the very things that made the strike special speak to some of the challenges that continue to face working people, And given massive inequality, along with a multi-generational assault on the rights and expectations of working Canadians, it may well be the case that the lessons of Winnipeg are as relevant today as they have been at any point since the end of the Second World War. Second, the strike was a moment of inter-ethnic solidarity among Winnipeg’s working people, even though there were real divisions between the city’s Anglo-Canadian workers and the growing population of immigrants, largely from Eastern Europe. Indeed, most of Winnipeg’s unionized working people belonged to relatively exclusive craft unions which were indifferent at best—and hostile at worst—to the growing immigrant population from non-British Isles countries. Despite this, the strike unified working people in the city against the capitalist class—whatever their nationality or citizenship status—which caused existential terror among the elite. In this way, they launched attacks against strikers by disproportionately targeting the city’s immigrant class, who were deemed to be part of a subversive ‘alien’ insurrection against venerated British traditions. This has a multifaceted relevance today, largely because workers in our own time are still divided by race, religion, and citizenship status, which allows a much more tight-knit capitalist class to perpetuate its power. As it was in Winnipeg, it must be understood by workers today that if we are to build a more just society, the victory can’t just be won for and by western European Canadians with citizenship. It must include all working people in this country—settler or indigenous, permanent or temporary, racialized or not. But while there is a need for a more comprehensive solidarity among workers, we must grapple with the reality that challenges, be they contemporary or historical, are not borne equally, and as such, those of us with greater legal, social, and economic security must stand for the rights of others. Finally, we must remember Winnipeg as a general revolt against capitalism broadly defined. In some ways, there may be a desire to whitewash the goals of the general strikers, making the event more palatable for modern audiences and governments, who want to harness the legacy of this foundational event, but don’t want to reckon with the fundamental aims of said event’s actors. To be sure, many, if not most of the strikers were not in favour of the violent overthrow of the Canadian state by Bolshevik means, and not all wanted a total transition away from systems of private property and market economies, but neither was this merely a demonstration for meager reforms within a capitalist rubric. This was a broad endeavour for a new social order, and while the strikers didn’t all agree on what that order would eventually resemble, they all stood in opposition to stark economic inequality, the failures of private control of major industry, the lack of democracy within and beyond the workplace, and in favour of a general idea that basic human needs needed to trump the narrow and unaccountable desires of capital and profit. Today, we can see much of the same thing. Many of us have real issues with the state of our society, and while the solutions aren’t always held in common, there is a sense that a deep unfairness pervades most every nook and cranny. The strike—and general labour revolt—was valuable because it channeled this broad discontent into a critique of capitalist society, and so today, we need a coalition of the left and labour to do much the same. Certainly, the voices in that coalition will disagree on a great deal, but they must insist on a common program which will find mass appeal among the broad working-class. Visual for a new sculpture commemorating the 1919 Winnipeg General Strike. Courtesy of Bernie Miller and Noam Gonick. One hundred years later, much has changed. It would be hard to argue that Canada isn’t a more humane and just place overall. But we can’t hide the fact that we still have unfinished battles left over from Winnipeg 1919 and the general labour revolt it was a part of. 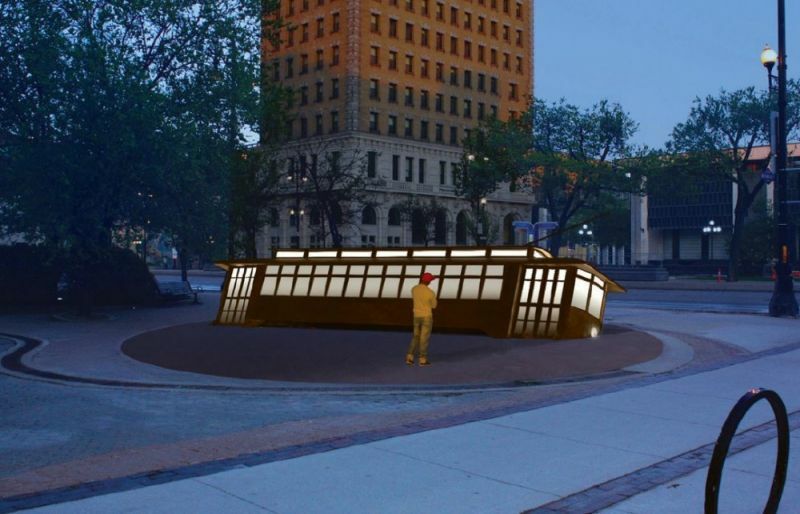 This year, there will be various memorials and conferences dedicated to studying and commemorating the strike, but crucially, these events are also taking the opportunity to look forward, and see how we can do the legacy of Winnipeg proud over the next century. The women and men who put it all on the line in 1919 deserve nothing less.